Golf carts are no longer confined to golf courses. These leisure vehicles have been making the rounds through neighborhood streets, community parks and pedestrian sidewalks. With their low speeds and easy operation, they can lull people into thinking they are safer than they actually are. Dr. Jesse Walck, medical director of the Pediatric Emergency Department at The Studer Family Children’s Hospital at Sacred Heart, said he’s treated golf cart-related injuries in the ER. A study by the Center for Injury Research and Policy found the number of golf cart-related injuries rose by a staggering 132 percent from 1990 to 2006. The most common types of golf cart-related injuries were soft tissue damage, such as bruises, fractures and lacerations. Other injuries included concussions, internal injuries, subdural hematoma, spinal cord injury, or acute respiratory compromise. The number of injuries will continue to rise as demand for recreational golf carts continues to grow. Nathan Ford, public information officer for the City of Gulf Breeze, said he understands why people find golf carts an appealing mode of transportation. Ford said it’s important for people who are operating golf carts to know they have to follow all rules of the road that apply to conventional vehicles. For example, a person cannot consume alcohol while driving a golf cart, or drive through park or field systems and pedestrian sidewalks. “Since public safety is a major concern for the City of Gulf Breeze Council and the Police Department, we are actively reviewing policy on golf cart usage and registration,” he added. In Florida, 16-year-olds are required to complete driving education classes before they get behind the wheel of a car. Children’s inability to understand the rules of the road can lead to a serious accident, Dr. Walck warned. Under Florida law, golf carts are designed for use on golf courses and for certain recreational purposes. They may not be operated on public roads or streets by anyone under age 14. Also, these motorized carts are not allowed on roadways where the posted speed limit is greater than 35 mph. 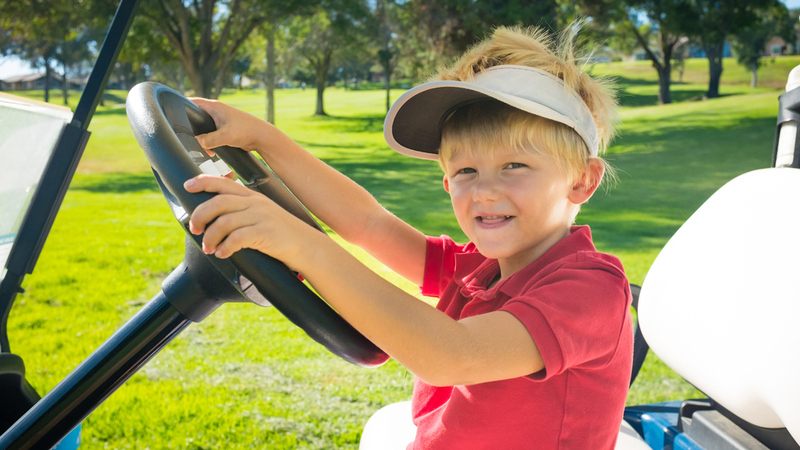 Don’t let children younger than 14 drive golf carts unsupervised. Don’t overload with passengers or equipment. Don’t let children ride on your lap. Keep arms and legs inside the cart. Sit back in the seat and use the hip restraints. Wear seat belts when available. Are prepared to use the handgrip to prevent a fall. This advice for keeping your kids safe is proudly shared by Sacred Heart Health System. To learn more about how we care for our youngest patients, visit sacred-heart.org/childrenshospital.